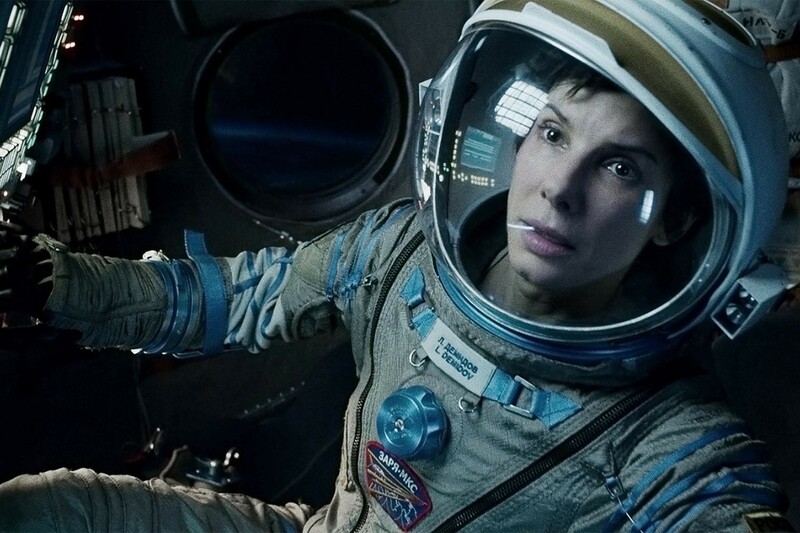 It dawned on me that the Russian space suit worn by Sandra bullocks character after she makes it back to the ISS is not rated for any EVA use. It has zero ballistic resistance and doesn't carry its own environmental system. It's called the Sokol space suit. I can see why she don's it, but I can't imagine her being able to survive very long in it because the air is supplied externally. My question is, How long would she be able to stay alive given the extremely limited internal environment? Was the director just using artistic license with this suit and expecting us to buy into his idea? In the "fire extinguisher" scene, where she uses the extinguisher to get from the capsule to the Chinese station, the scene is done as one continuous "take". It takes her approximately 3 minutes to get inside the station, which is tight but technically do-able even just holding her breath. The biggest problem with the scene is that IRL it takes several minutes to pressurize an airlock; she could easily have died of asphyxiation while waiting for it to cycle. The Sokol suit is designed to be plugged into an external life-support unit. The only artistic license was not to bother showing her plugging and unplugging from the capsule's LSU, which could be confusing to audiences that are used to thinking of all spacesuits as fully self-contained units. Designed in response to the suffocation death in 1971 of three cosmonauts aboard the Soyuz 11 mission to the Soviet Space Station Salyut, the Sokol space suit was first worn by Soviet cosmonauts in 1973. Unlike bulky EMU (spacewalk) suits, the sleek Sokol suit can be worn in the exceptionally tight quarters aboard the Soyuz spacecraft where there is no room for cosmonauts to wear extensive life support equipment. The suit, which weighs 22 lbs. (10 kg), consists of an inner pressure layer of rubberized polycaprolactam and an outer layer of white nylon canvas. 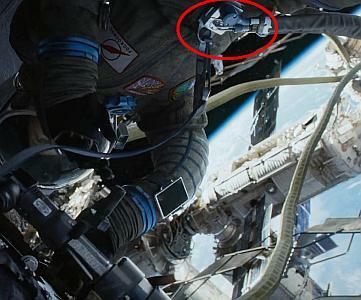 Boots are integrated with the suit, but gloves are removable and attached by blue anodized aluminum wrist couplings. The polycarbonate visor can open on hinges mounted near the ears and seals with an anodized aluminum clavicle flange; the hood folds when the visor is raised. The suit has four pockets and adjustment straps on the arms, legs, chest and abdomen. The Sokol has a suit pressure gauge on the left wrist and a mirror on an elastic wrist band that helps the wearer see things otherwise outside his/her field of view. During re-entry, an altimeter on a wrist strap may also be worn to measure cabin pressure and alert the wearer when to brace for touchdown. A wristwatch is often worn as well, with an elastic wrist band replacing the strap so it may fit over the bulky suit glove. Electrical cables are mounted on the right abdomen of the suit; separate hoses for air and oxygen are on the left. An electric blower ventilates the suit with cabin air and, if the cabin pressure drops, the air supply is automatically replaced with oxygen from pressurized bottles. Air and oxygen exhaust through a pressure relief valve at the center of the chest. The suit is intended to be worn for up to 30 hours in a pressurized environment or two hours in a vacuum; it can also float and has a neck dam that allows the visor to be raised in water without the risk of flooding the suit. The current version of the Sokol has had the mobility issues improved, and it is possible to manually adjust the relief valve (the blue thingy in the middle of the chest area) to compensate for the "ballooning" effect for short periods (<15 minutes) , although it's not recommended. It's not for protection against meteorites (or rather: very basic protection) but as reinforcement allowing any basic movement we see all sorts of additions to suits to make them EVA-rated. You really think any breastplate from any material will resist sizable (i.e. 1mm diameter) micrometeorite travelling at 20 kilometres per second? NASA claims "yes", but I'm not so sure (very fine space dust <0.2 mm is theoretically survivable). It is very low probability event, however. I'd imagine that someone went along this route: "we need a Russian spacesuit". No one asked "in what scene/take?" and there's the effect. Not the answer you're looking for? Browse other questions tagged space gravity-movie or ask your own question. In Doctor Who's The Time of the Doctor, how is sound heard in outer space? How well can xenomorphs survive the vacuum of space?